One thing that's annoying at my selfmade nas is, that the harddisk drives keep park thier heads. Any recent hdds do this to save power, and some systems even have motion detectors, that will park the head at forthcoming crashes, to prevent damage. The manufacturer set this value very low. In my notebook, my hdd clicks every 2-5 seconds, if there is no disk usage. As a matter of facts, you can see in detail here, that one of my drives already parked its head 11.040 times in 283 hours. Since the hdd is designed to do about 300.000 parking processes, you would reach the limit in a few months. Western Digital (WD) offers a tool (WDIDLE3.exe) to increase the idle value till the head parks, or you can completely disable it. The bad, this tool only works under DOS. 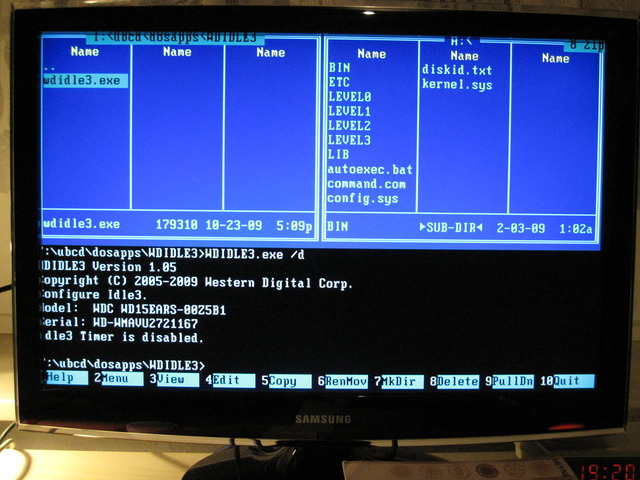 Ultimate Boot CD (UBCD) is a set of system tools for partitioning your hard disks, check main memory and get information about your system. It's also a FreeDOS live disk. So, I've made a custom iso image of the recent UBCD (v5.03) with the WDIDLE3 from WD included. WD15EARS, WD20EARS, WD20EARX, WD30EZRX, WD10JPVT. I've made a new image which is lighter and easier to use. Actually it is just a rip off of the current UBCD (v5.11) that only contains the FreeDOS image and the WDIDLE3 binary (Thanks for the comment!). This will disable all parking and the click noise on all attached WD drives on your system. Maybe you have to try wdidle3.exe /s300 if you don't have success with wdidle3.exe /d as mentioned in the comments. The tool worked with my WD Green WD15EARS, even if the home page states the drive isn't supported. -> in the menu with 4 choices, pick "Exit". Copyright (C) 2005-2009 Western Digital Corp.
/S Set timer, units in seconds. Default=8.0 (8.0 seconds). Resolution is 0.1 seconds from 0.1 to 12.7 seconds. Resolution is 30 seconds from 30 seconds to 300 seconds. Note, times between 12.8 and 30 seconds will be set to 30 seconds. Thanks for this. Though when I get into Volkov Commander I'm having trouble finding wdidle3. It isn't under T: or any of the drives I have listed. Any idea what I may be doing wrong? You can open and verify that it's really there with any image tool. Thanks for your help. I still don't know what my issue is, but I was able to get wdidle3 to work. My problem now is that I can run wdidle3 /r, but wdidle3 /d gives me an error about being write protected. Now it says this for a:\ which is my boot cd, but when I try to switch over to the hard drive letter before loading wdidle3 I can't because its on the cd. It is detected the hard drive fine though it seems. Any thoughts? Sorry for all the questions, but this is the only place I've got any sort of feedback. No Problem, I'm happy to help. You don't have to change to your hard disk, maybe it's better to leave it untouched, so that it is not mounted. i don't know, if there is any difference between an actually used device (mounted), or not. I don't think so anyways. I've googled a bit, since that never happend to me, and found a link. Here is a guy telling, that you can set the timer also with wdidle3.exe /s 300 to 300 second timeout. I guess, that will be more than enough. You can verify it with wdidle3.exe /r. the drive has accepted the new timer. generate errors using this command. The best is to change the timer to 300 seconds. Once done, shut your PC off and repeat step-6 for each WD Green drive 4K drive. It's not the command. Even "wdidle3 /s300" gives me the write protection error too. I'm wondering though if I follow the USB stick guidelines instead of CD that will help me deal with any problems. Ah, i didn't get that, sorry. The only thing that occurs to me is, that some BIOSes, commonly in notebooks, have a write protection mode for locking the disk if the device is stolen/lost. That works over some mechanism in the hdd firmware. Maybe you have some option there to turn it off? Here is some more info. You could also check for a jumper on the back of your disc, maybe there is something. And as a general recommendation, copy and paste the whole error message into google, maybe that gives you some help. Thats, what i would do, after looking into the bios. Can I use this image for Western Digital WD5000AADS Caviar Green? It should work with your device already (it does with most current WD hdds), and since WD didn't update the WDIDLE utility since Okt. 2010, i couldn't even do a new image. Did you try this one?! I think it'll work, .. I was randomly playing around looking at drive parameters in SpeedFan out of boredom when I decided to click in-depth analisys on my WD6400AADS acquired 9 months ago. I was already used to a power-on hours warning since my computer runs around the clock hardly ever stopping but googled the Load Cycle Count just for the heck of it. I was alarmed to find out about this known WD Green problem and how it meant the drive had used up little over 1/3 its rated parking wear in such a short time! It was already at 112000+ cycles out of the rated 300000 on the manufacturer's specs page. I immediately decided to act. I downloaded the ISO you have provided here and after checking the tool's MD5 against the website's one and finding it uncorrupted on the DVD(can never be too sure and must exercise and proceed with maximum caution with this kind of thing) I then booted DOS. My experience was a bit scarier. Upon running wdidle3 /r to check if the drive was indeed set to 8 seconds, DOS froze. But here's the thing - it froze AFTER the tool finished and the "Norton Commander-like" app tried re-loading, indicating that the tool itself had successfully finished running. I then restarted and did the actual /d switch, disabling the timer with success. DOS again froze. I came back in Windows and everything was absolutely fine. During the time I took prepping for the write then reebooting, the drive's cycles went up to 116511, a full 4k in some 30 minutes! I am honestly spooked to see how quickly this thing was aging! Thanks to the tool and your provided download package facilitating everything(I've not used DOS in a while, let alone Linux-based software) my cycles are now going up by exactly 0 unless I power on/off the machine(I had idle drive poweroff disabled for years now, I don't like hearing that spinup sound and waiting when I re-access an idle HDD). I was scared since I have another 3 drives in the computer - a WD800JB(80GB), a 320GB model and a 160GB Maxtor - but the tool didn't damage anything. As I understand it the tool doesn't even touch IDE/ATA drives(which is what my 80GB and 160GB drives are). I don't have to be worried about the head now crashing in the event of a power failure I hope right? My 320GB already had it idle3 timer disabled and never suffered from a power failure. And this is just "idle3" state timer, not a global setting for ALL head states, right? That's strange, it never froze my system here. But as long as it worked, it should be okay. If a harddisk's power is interrupted and the heads are still loaded, the heads still park without damaging the disk, called emergency unload. They can because of the momentum they have and the air pad under the heads. The manufacuters also have a minimum specification here that is usually around 20,000. But however, that would be no difference if your drive had the idle timer on or off, cause they don't matter in that case. The SMART attributes lists a couple of information about the device. There is also a "Power-Cycle Count" (only lists power on/off state), which should now raise in common with your "Load-Cycle Count" (lists all states of the head, i.e. emergency off, idle off, ..). You're welcome. Good to hear it worked out for you, even if it was a bit of a hassle. Just tried to use wdidle3 on a WD10EADS, with an AsRock AliveXFire-eSATA2 R3.0 motherboard (AMD 480X CrossFire chipset) and 240e CPU - locks up completely when trying to use wdidle3. Luckily I had another PC, i945GC chipset, onboard graphics, Conroe 1.8 GHz. Obviously there's something that can lock up wdidle3, but what? Maybe SATA / IDE-emulation mode? I think the default on the intel board is IDE-emulation mode, but I'm probably not going to play around with it. I also have a WD10EACS which doesn't have the problem, never heard a click from it. Why did WDC have to muck around with these drives, were they trying to fix something that isn't broken and made it worse? Btw, thank for the iso; probably saved me a lot of time. would this tool erase data on my hdd? No, your data remains untouched, it just alters the firmware of the drive. I've added a link in the article to the Western Digital site where you'll find more information about it. Any message or output appeared after you've entered the command? Maybe you give that a try? hi zab. i have successfully disabled the idle3 timer on my wd 500gb scorpio drive. i'll let you know if my load cycle count would go up in bunches again. as of the moment it is 3216. thanks a lot! hi zab. after i've tried the /d it went up in bunches again. i think the scorpio drives are meant for enabling the timer. so i set it up to /s 300. right now my lcc is 3245. will update you again. thanks. currently my lcc is 3681. the /s 300 is the best option for scorpio blue drives. I bought a netbook which has WD Scorpio drive in it (WD1600BEVT). It made me crazy by clicking and spinning down and up after only few seconds of inactivity, making the system freeze for a moment all the time. I found wdidle3.exe and tried to disable that thing and it seemed to work, but after shutting down or returning from standby, the drive has lost that setting and is clicking and spinning down again! Any ideas of how to make the setting permanent? There is no T: drive. There is no "ubcd" directory. Yes the wdidle3.exe program is in the ISO, but it doesn't help if it cannot be accessed from within FreeDOS. The ISO does not work. Don't you think your conclusion is a bit exaggerated, if not wrong? As you can see from all the other people here, it does work. Now, if it works at say 20 installations, and yours not, you come to the conclusion it does not work?! So, what math is that? And also, if you can see from the other comments here, the device letters aren't always the same and change within installations. So maybe it is A: at your device or something, but it is easly to find out in the Volkov Commander. And as you stated right, the program is on the iso. Hence you start from it, it is accessible. So, what exactly is your problem? Works just fine for me, you must be doing something wrong. Sorry. Many thanks to the author though, worked a treat. Thanks a lot for this... I used your ISO of UBCD and it appears I was successful so far. (this machine is back up only for 30min) I have a WD20EARS-00MVWB0. It's been running about 6 months and has been fine until now but for the last couple of weeks, the parking click noise got louder and was driving me crazy. For anyone reading... I used the directions above and chose option 5 "EMM386 (semi defensive)". "wdidle3 /r" showed that the drive was set to park every 8 seconds. I tried "wdidle3 /s10000000000" after googling a bit. This produced only an error. I then did "wdidle3 /d" as above and got "timer disabled". The drive is quiet once again so far. Thanks a ton for the iso! By the way, "wdidle3.exe /d" didn't work on my WD20EARS; although Idle3 claimed the timer was successfully disabled. However, "wdidle3.exe /s300" worked great. FYI, UBCD since 5.1.0 (july 2011) now comes with wdidle3 V1.05. I had a WD Green in my HP Microserver just operating as a data drive (no raid) and it had over 250k start/stops! Mounted the iso on my HP Microserver's Remote Access Card and it worked perfectly to disable it. Btw there is no space between the s and the 300, so the correct syntax is s300. Many thanks for this ISO, worked perfectly and saved me a lot of hassle. I did bcd, imgburn, tracked down my XP disc, emulation / no emulation, pulled out my hair. I could never get DOS with wdidle3 at the same time. Your ISO allowed me to save my sanity. The image worked flawlessly, fixed 4 WD30EZRX in a jiffy. I really appreciate your effort and willingness to share. I set my green drives to 300 seconds. You get my vote for good citizen of the day. Saved me a ton of time...after I already wasted nearly 2 hours of frustrating image creation, boot disks, and wdidle failures. Works perfect with my WD10JPVT. Thanks a lot! Your image saved me a lot of time! Am I missing a step or something? Is there a way to boot this from a USB drive? I used rufus to write the iso to a USB drive. When booting from it it just says Syslinux blah blah boot: and stops there. I've also just used this image with Rufus, worked flawlessly. The drive is WD40EZRX, which was initially configured for 8sec idle timeout. Hi. I've got a green wd30ezrx drive since 2012 with 68500 cycles and 4700 hours on it. It's in a zyxel nas. I don't know if i can run this command ipon my nas directly because i only have a notebook and not a desktop pc. Do you think i need to run this? Worked a charm - updated three WD drives with a few keystrokes. Thanks a lot! My previous green WD disk has crashed after four years. I suspect that the aggressive parking threshold was the cause. So, for my new green WD I put the threshold on 300 seconds. Your customised UBCD image was very useful to me. I am having this weird problem with my WD EZRX 2 TB Green. Suddenly it disconnects from pc. I have to leave it at rest for couple of hours in unplugged state, afterwards when i reconnect it again my pc can show it and then it stays connected for like 5-6 or sth like that then automatically disconnects again. I ensure you that it is not pc specific problem. Is there any solution for it? I will appreciate anyone's suggestion. TIA.